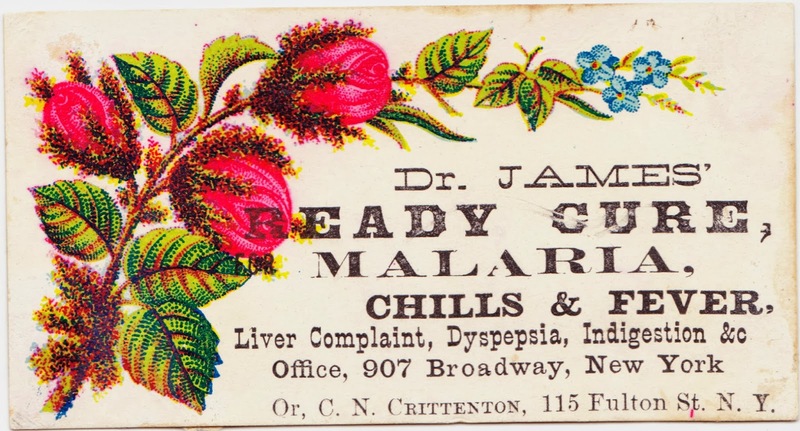 The card even offers a backup plan if you can't get to Dr. James: Head for C.N. Crittenton at 115 Fulton Street. "Born in Henderson in Jefferson County, New York, Crittenton went into the drug business in New York City in 1861. However, after 1882, when his 4-year-old daughter Florence died of scarlet fever3, he devoted his time and wealth to the establishment of the Florence Night Mission to 'rescue' prostitutes, and later Crittenton homes for homeless and unfortunate girls and their infant children. In 1898 the National Florence Crittenton Mission received a federal charter to carry on this work. Of these mission homes more than 70 were organized in Mr. Crittenton's lifetime." 1. For an excellent history of visiting and business cards, see this April 2012 Design Float Blog post. 2. Daytonian in Manhattan offers a neat history of The Warren Building, which takes up Nos. 903-907 on Broadway in Manhattan. 3. Scarlet fever was just mentioned a few days ago here, in "A child's traced and colored pictures from long ago."